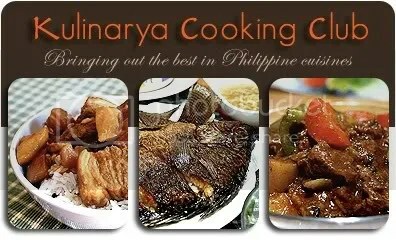 Kulinarya was started by a group of Filipino foodies living in Sydney, who are passionate about the Filipino culture and it’s colourful cuisine. This month’s Kulinarya Cooking Club’s theme was chosen by Myself and Malou from Skip to Malou Blog. It was only fitting that it was our turn to chose the theme as it is both our birthdays in August. Happy Birthday, Malou! 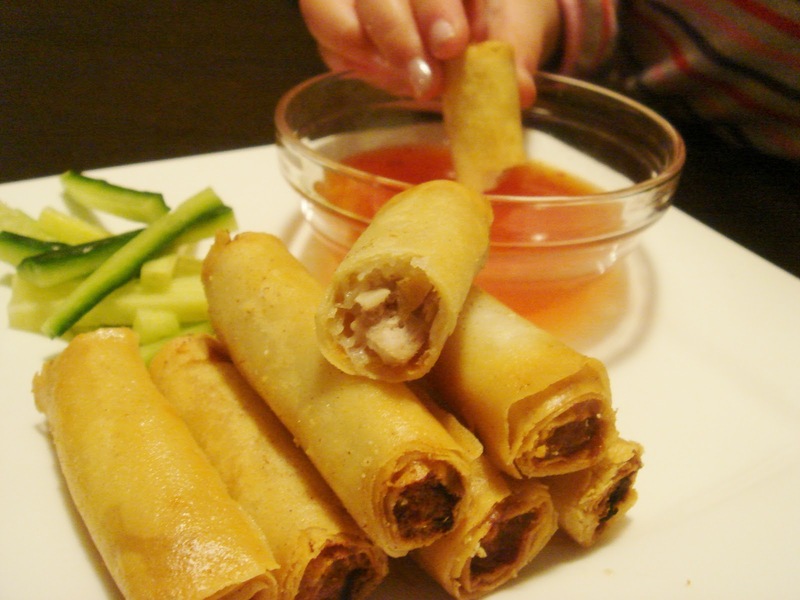 This month’s theme is LUMPIA! Malou and I both wanted to choose a theme that was associated with party food as we would be celebrating our birthdays this month. And without a doubt, Lumpia is always at every Filipino party table. 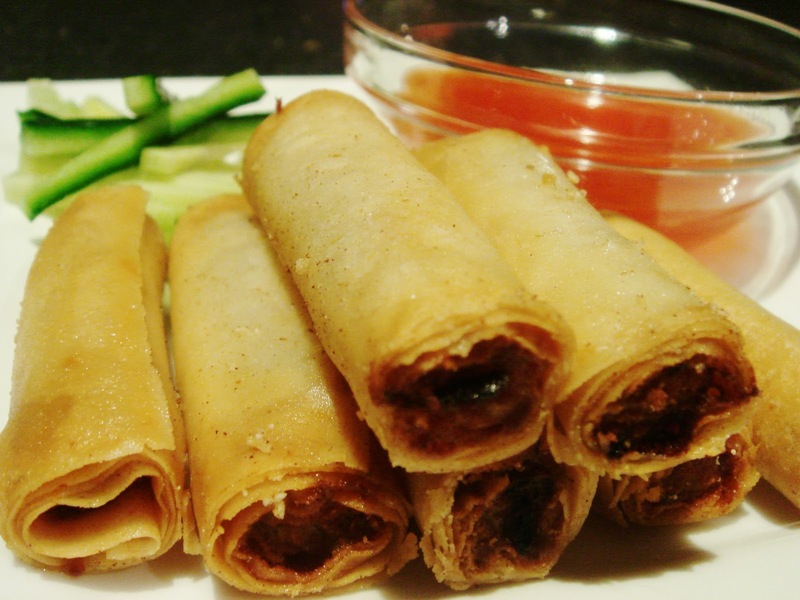 There are variations of lumpia. I decided to feature 2. Lumpiang Shanghai and Lumpiang Sariwa. 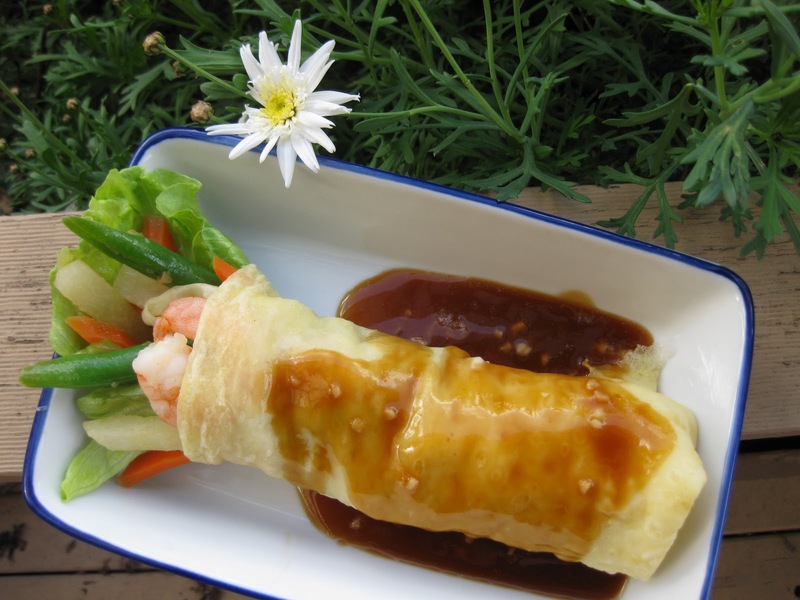 Lumpiang Shanghai is a favourite amoungst all Filipinos, most especially the younger ones. 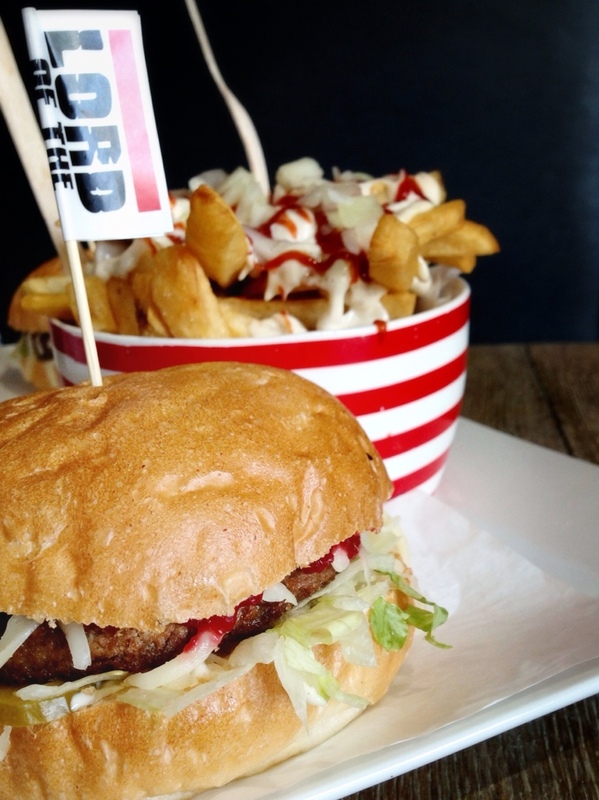 It’s easy to eat and more importantly, it’s easy to make. Place all the ingredients in a bowl and mix thoroughly till well combined. To wrap, place a wrapper down on a flat surface. Line filling in a straight line about 2cm from the bottom of the wrapper. Roll the wrapper into a long cylinder. Before deep frying, cut into 4 equal parts. 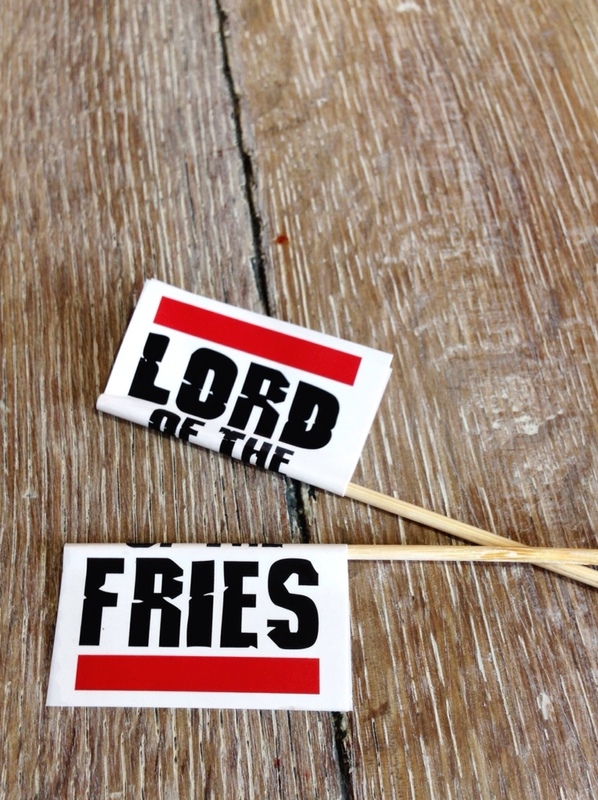 These can be fried immediately or frozen to be cooked later. I never really eaten this beaten this before but saw it many times at Filipino celebrations. I wanted to make it because I really wanted to try it and I knew I would like it… and I did. With the help of my mum, I’m glad we did because I loved it. 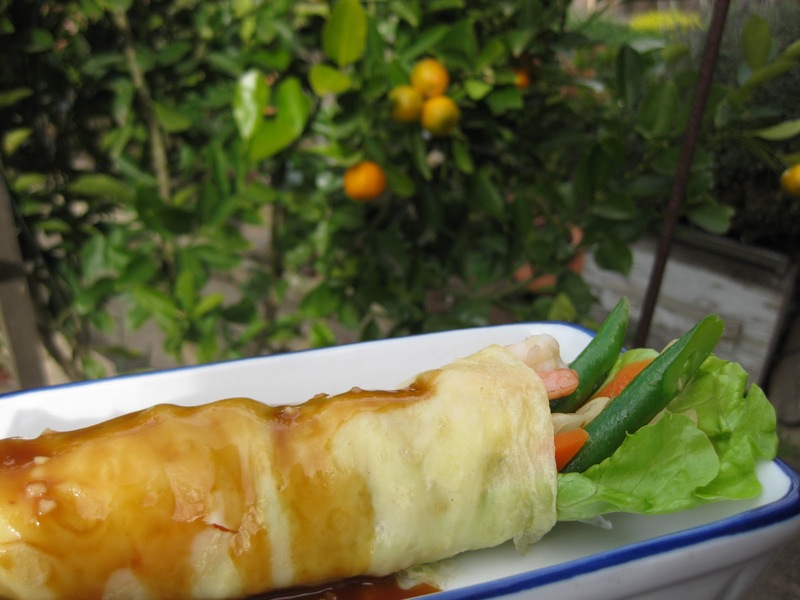 We made a vegetarian version and added fresh cooked prawns. 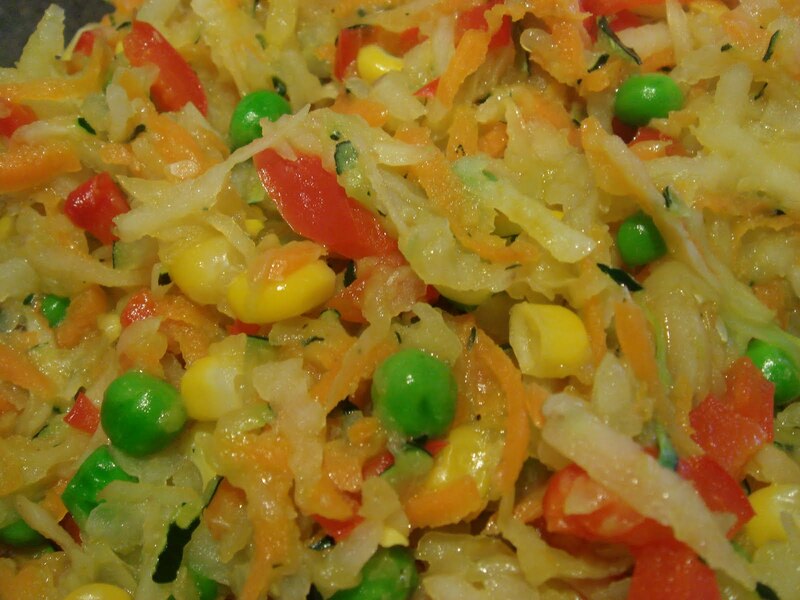 Quickly cooking the vegetables keeps them crunchy and full of flavour. I’m also proud that we made our own wrappers for this lumpia though, I think I need more practisc with it, as it came out a little thick in places. However, it still tasted delicious. To make the wrappers, place the flours, and salt in a bowl. Add 1 1/2 cup water, whisk to combine all the ingredients. The batter should be fairly wet. Add the eggs, one at a time and whisk well.. Cover and refrigerate for 30 mins. On a nonstick skillet, on medium heat, add about 1/8 cup of the batter. Swirl the pan to thinly cover the pan with the batter. Cook until set (you’ll see the edges curl a bit) Flip and cook the other side. This should only take a minute all up. Remove and keep covered until needed. In a saucepan, sautee the onion and garlic till just translucent. Add the rest of the vegetables and stir well. Add the fish sauce. Cover and let cook on a gentle heat for 5 to 7 minutes. The vegetables should just be cooked through leaving it still a little crunchy. Once cooked, remove from heat and transfer to a dish to let it cool. To make the sauce. On a low heat, in a small saucepan melt the sugar . In a bowl, mix a little water, soy sauce, cornstarch and salt into a smooth paste. Then add all the water to this paste. Poor this mixture sugar. Add the garlic and stir over heat until thick. To wrap the lumpia. Lay a wrapper on flat surface. Place a lettuce leaf on the wrapper, with a quarter of the lettuce protruding at one side (left side). Place the filling on top of the lettuce. Fold the side closest to you over the filling, fold over the bottom (right side) over and roll the rest of the wrapper over to totally enclose the filling. Serve with sauce poured over. The days are now starting to get colder. The mornings are crisp but the sun warms up the day a little. In the evenings it’s nice to curl up on the couch with Hubby and my babies to keep warm. Even better, on the couch with my family AND eating a nice bowl of hot soup. I’ve never had split pea soup before but I thought I’d give it a go. I’m glad I did. 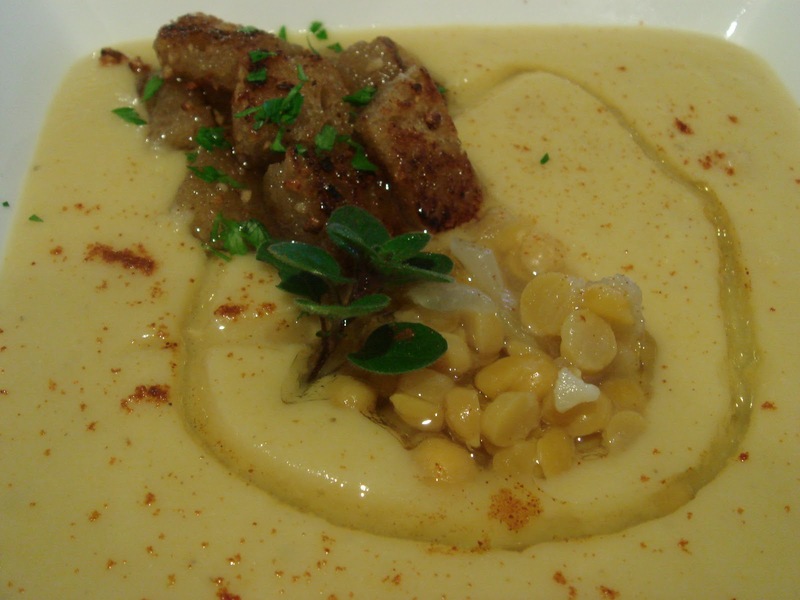 I love the texture of this soup. It’s thick and has different layers of textures. I’ve cooked split peas before. 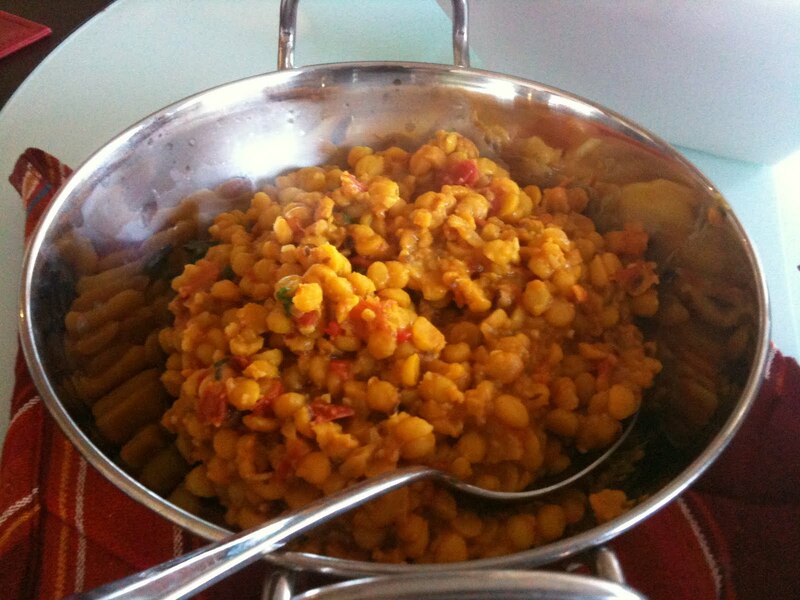 I’ve made Indian Chana Dahl. 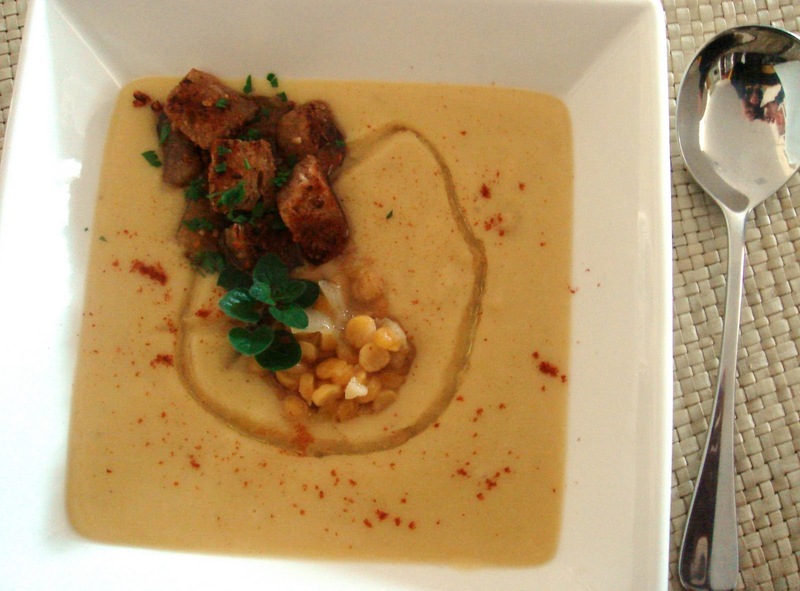 That dish made me realise that I do like to eat split peas. I made garlic croutons to accompany the soup to add another layer to it. It’s quick and very tasty. I used a light rye bread and quickly fried it in butter with garlic and parlsey till crunchy. In a pot, pour in olive oil and saute the onions still soft. Add salt. Add the split peas and water and stock cube. Ladle 1/2 cup full of the peas into a bowl and set aside. Add the reserved pea mixture and lemon juice. If soup is too thick, add a little more water. To serve, ladle into a bowl. Drizzle with olive oil and add croûtons. Lightly sprinkle a pinch of paprika. I am so lucky to have parents and a brother that have shiny green thumbs. I get to have fresh produce and even better, for free. You can see my post on what I did with @MrEd2U’s eggplants here. My mum has a huge pumpkin patch in her back yard. I only asked for an eighth of a pumpkin because they are HUGE. I forgot to take a pic of the whole pumpkin so I can show you. I only managed to only use half of that anyway. I peeled and cut the rest and froze for another time. 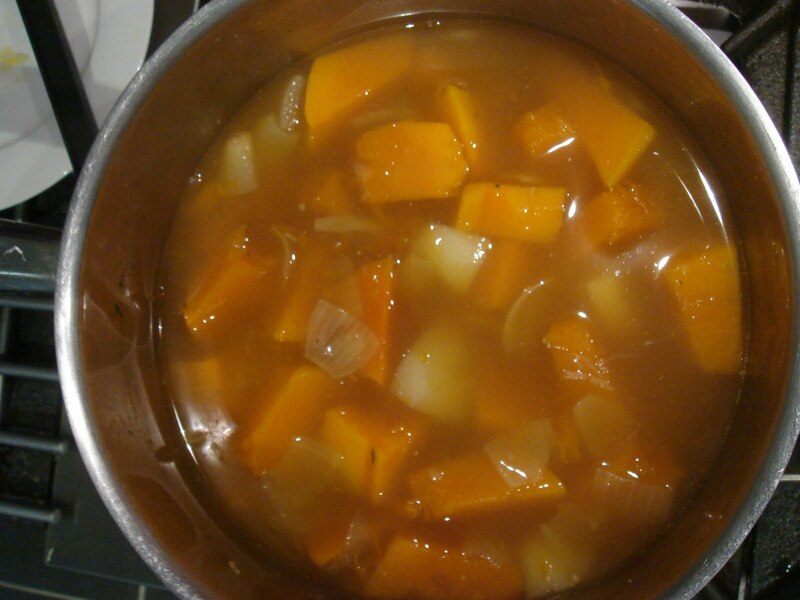 I decided to make pumpkin soup for Hubby. The problem is, my Hubby, doesn’t like pumpkins. In fact he doesn’t like any orange vegetable! Crazy, I know. 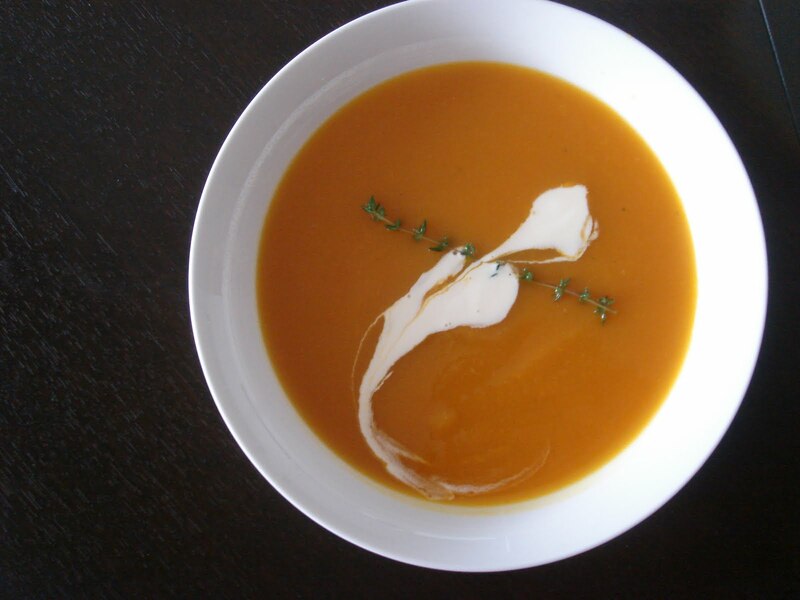 I wanted him to appreciate the sweetness of fresh pumpkin and I thought the best way was to make pumpkin soup. To entice him a little I added a few spices as he loves them. I went simple with the spices but any can be used. I am happy to say that Hubby loved it. I will definitely make him more with the batch of frozen pumpkins. 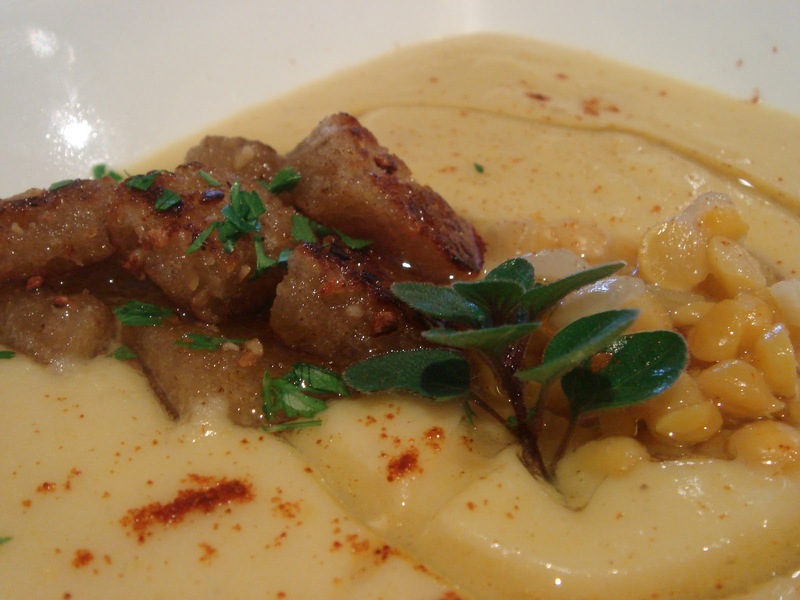 This week’s meatless day challenge was inspired by a dish by Nigel Slater. Using fresh tomatoes and grilling it and doing very little to it brings out the natural flavour of the sweet tangy tomatoes. 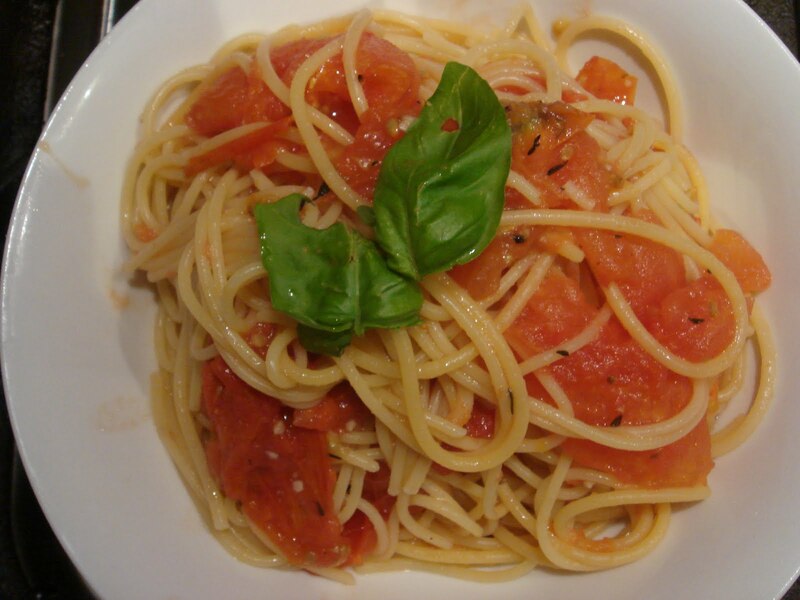 I love the idea of having pasta in a light and flavourful sauce. The best part of this dish is that it’s not only very tasty but it’s quick, so it’s perfect for a midweek meal. There really isn’t a recipe set in stone for this. It really is free form and you can add any herbs you like. 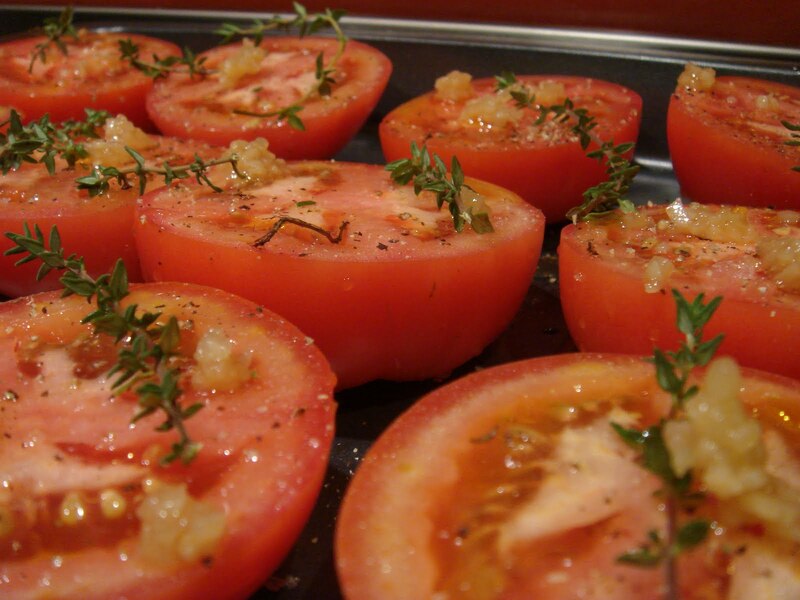 Half tomatoes and place on an oven tray. I used 6 tomatoes for 2 people but this was plenty. Drizzle really good quality olive oil over them and season with salt and pepper. I then added minced garlic and fresh thyme from my herb garden. 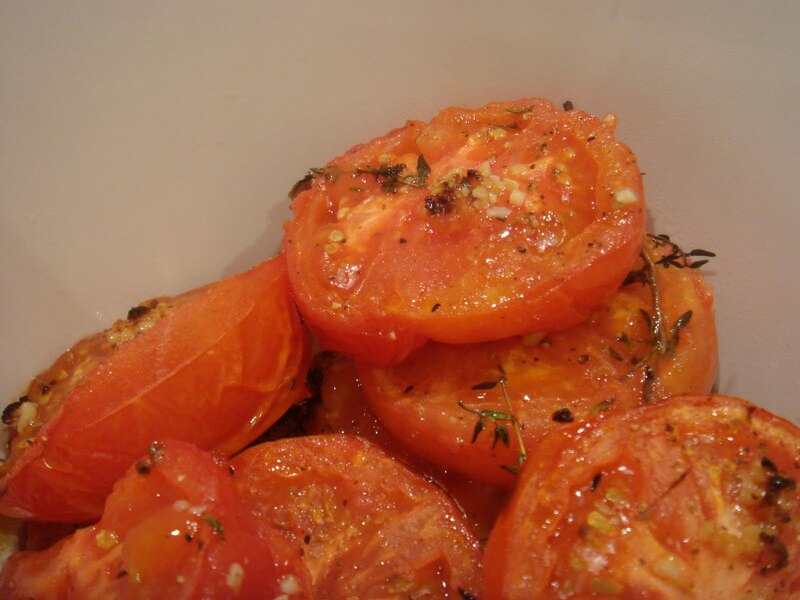 Place under a hot grill and cook for 15-20 minutes or until the tomatoes are soft. Place them in the bowl including all the juices that collected in the tray. Pour a splash of red wine vinegar. Roughly crush with a fork leaving some large pieces of tomatoes. Mix in some fresh basil. 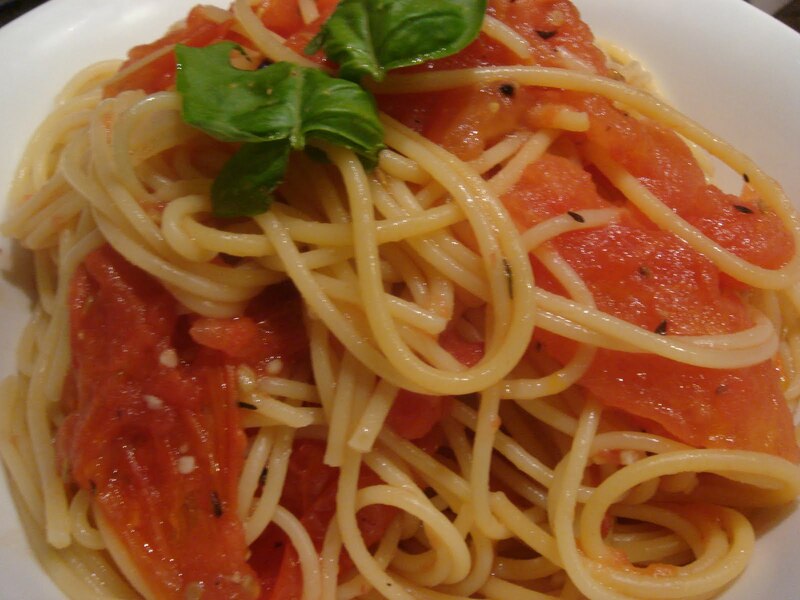 To serve, combine with cooked spaghetti pasta and enjoy. My family loves Quesedillas. I thought about making a vegetarian version for this week’s Meatless Day Challenge. I’ve never thought of just having vegetables in this but it’s delicious and you don’t even notice that there isn’t any meat in it. For my 3year old, that’s crucial. It’s quite easy really. you can take can any vegetable you want and sauté it in a pan till just cooked through. Make sure you don’t overcook and it still has it’s vibrant colour. I used whatever was in my fridge at the time, which was, zucchini (from my brother’s garden). 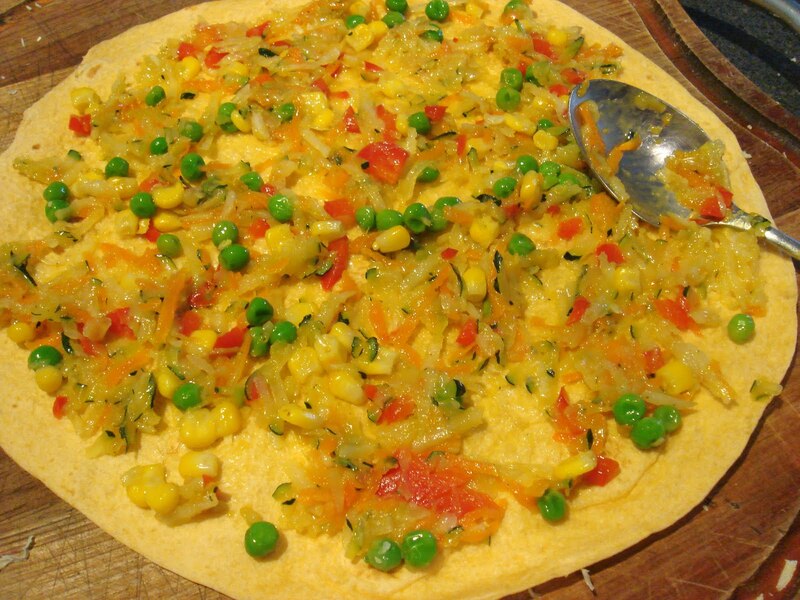 carrot, capsicum, onion, frozen peas and corn. Spread it as thick as you like on tortilla bread. But not too thick or else, it will fall apart when you are trying to eat it. 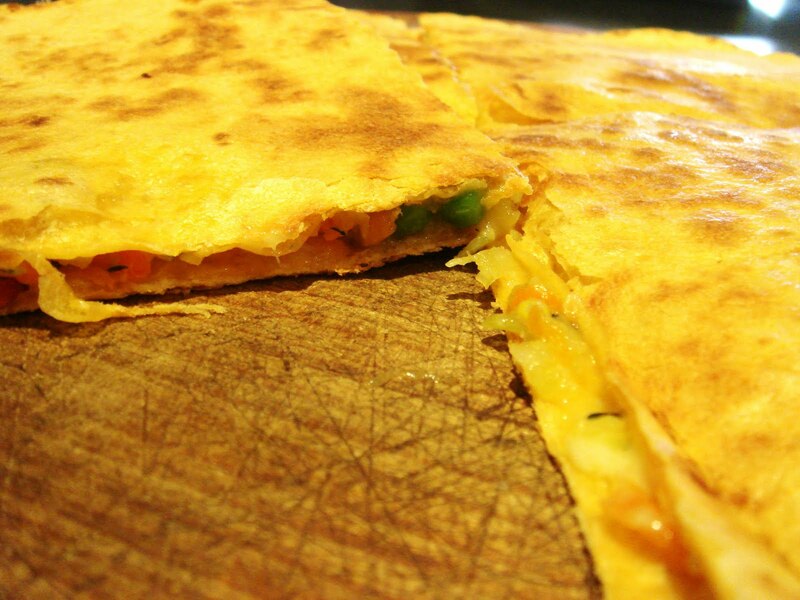 Top with lots of cheese then place another tortilla bread on top to form a sandwich. To cook, place in a dry not skillet for a couple minutes on each side. 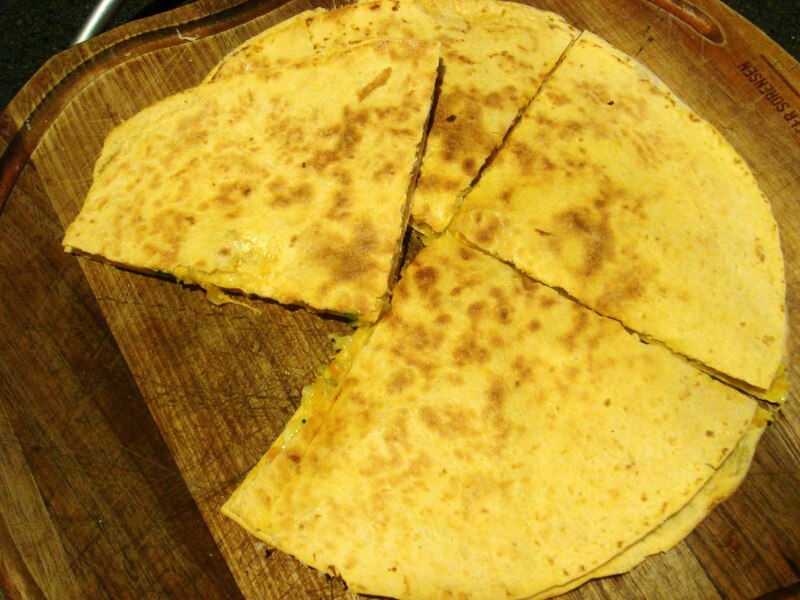 The tortilla should be slightly toasted and crispy and cheese nicely melted. 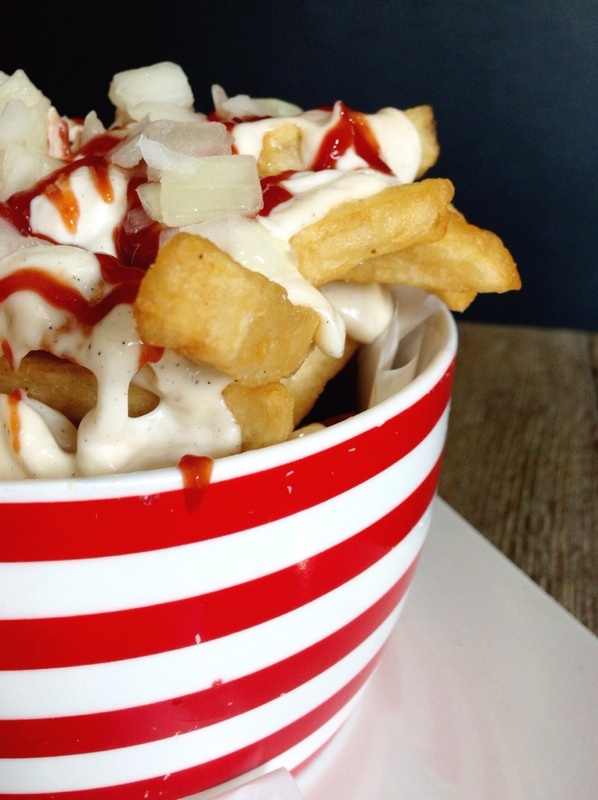 To eat, cut into wedges and enjoy! This week has been quite hectic. Easter was fast approaching and I had plans on baking hot cross buns and a breakfast feast for Easter Sunday. However, time got the better of me and I didn’t get the chance to do what I had planned. I did, however, make the time for our meatless day challenge as I knew the weekend was going to be full of eating and not to mention the eating of lots and lots of Easter eggs. 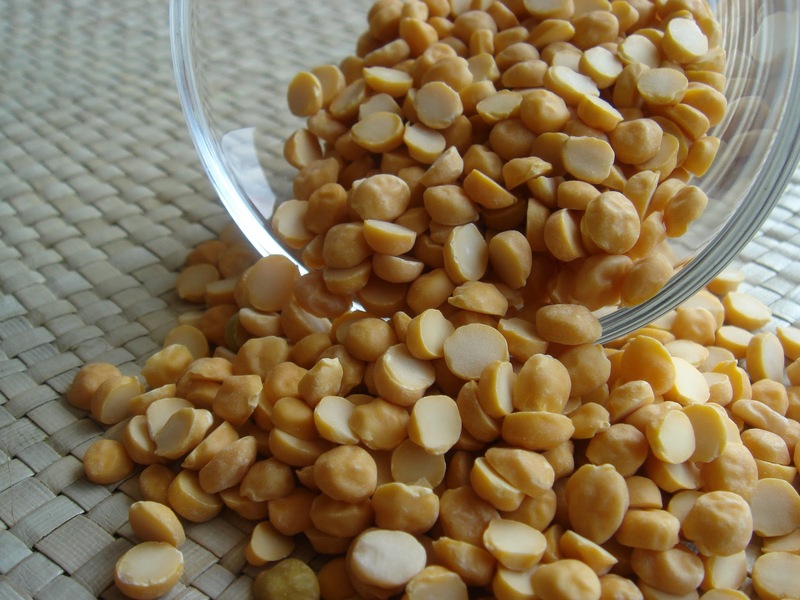 This week I decided to cook Chana Dahl. Hubby and I recently discovered an Indian Supermarket in our local area and bought many ingredients that I wanted to try out. I’ve only cooked with lentils once before and I remember liking it. I came across this recipe and wanted to try it so much. 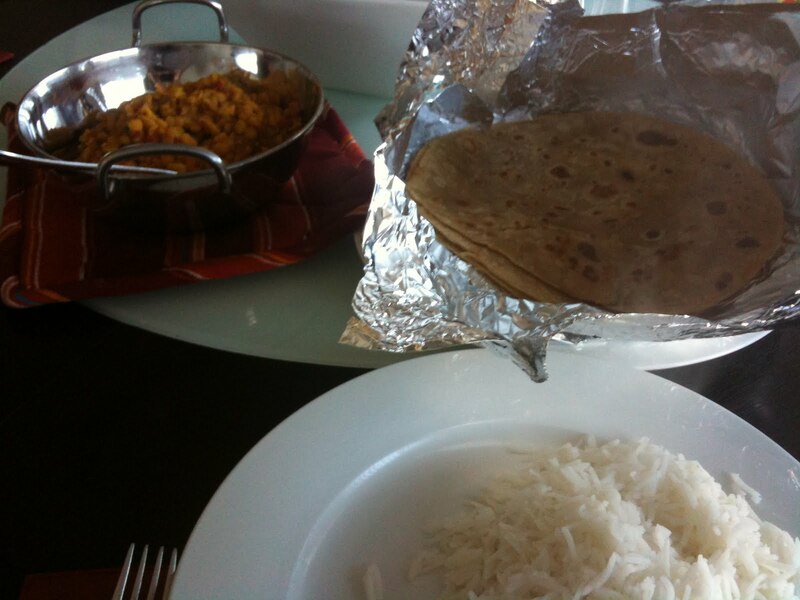 It turned out really delicious and filling. I will definitely be making this again. 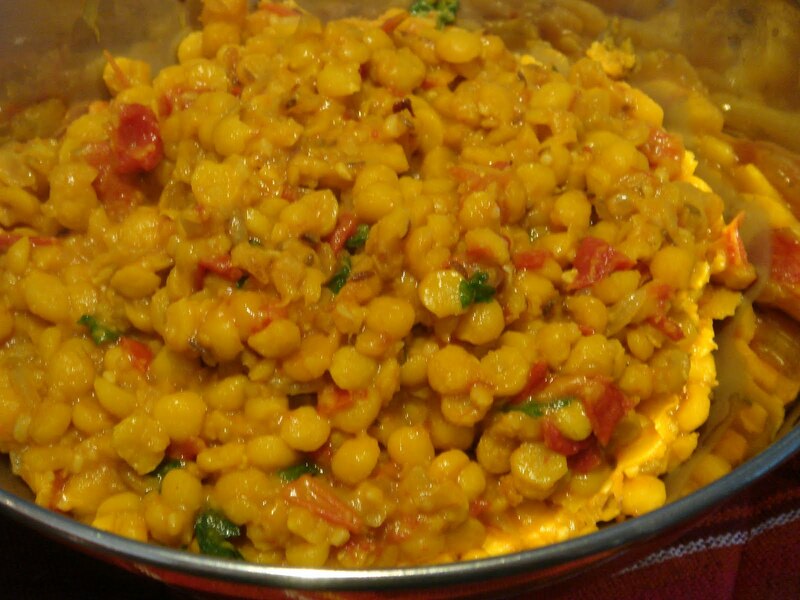 Cook the lentils with the turmeric and salt in enough water just to cover until tender but not completely cooked and the water has evaporated. Set aside. Heat the oil in a saucepan. Add the cumin seeds and fry until they crackle. Add the parcooked lentils and simmer gently until they are tender.